This book is written by Saiswaroopa Iyer, and is the second book she has written. I liked her first book also a lot, so I decided to give this book a try. I also picked it because the book’s title itself was extremely interesting. The title of the book is ‘Avishi: Vishpala of Rig Veda Reimagined’. I have never heard of Vishpala, and so the title intrigued me. I love the book, and so far, I would recommend you to place it on top of your ‘To read’ list. 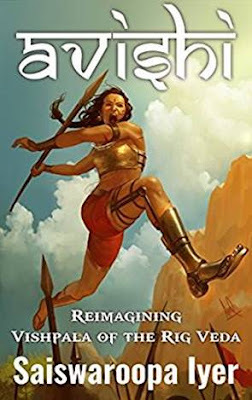 This fabulously written book revolves around the Avishi, whose life is based on the life of Queen Vishpala, a valiant woman who fought against Khela. Khela was an evil king who wanted to change the rules and regulations that everyone followed, and twist them according to his tastes. During a battle, Vishpala loses a leg, and has it replaced with a metal leg. Even though she now has a metal leg, it does not stop her from fighting Khela at the end. I loved this book, and it has inspired me. The way Avishi fought even with serious injuries, and her leadership should be a lesson to all of us. Saiswaroopa Iyer was able to build the plot up well, as towards the end when Avishi and Khela fought, I was holding my breath, waiting for how it would end. I have written a longer review of Avishi here. © 2018, Anvita Agarwal. All rights reserved. This book talks about Hanuman before he met Lord Rama. 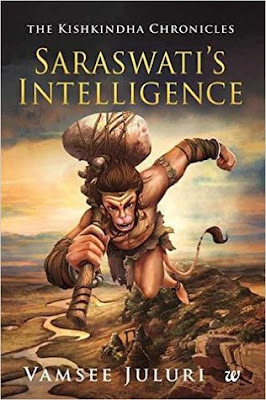 Vamsee Juluri wrote the book, and it’s the first book in the trilogy of Hanuman’s life, that he has been writing. It starts with a small race between Hanuman, Sugriva, Vali and other monkeys. Sugriva hurts himself, and spills blood, which Hanuman touches when he goes to help Sugriva. When the other monkeys saw the blood, they yelled ‘Parama Dharma Apchara’ and ran away. Parama dharma apchara was the violation of the prime duty. The people in Hanuman’s time believed in Ma Saraswati. She was the one who poured blood into their body when they were born. A single drop of blood was made of the sunlight of one hundred and eight leaves which made it so precious. Parama dharma apchara was when you spilt blood. He was thus banned from Kishkindha. He took Sugriva to Vishwamitra who healed him. They decide to accompany Vishwamitra on his journey to uncover hidden secrets in the north, followed by Sugriva. On their journey, they met the Ganeshas (elephants) who accompanied them. On their way, they discover a pack of deadly barbaric creatures who ate elephants and then used their skin to disguise themselves. After a study of the child, they realized that these creatures had to be tamed, or the parama dharma would be breached. Vamsee Juluri knows how to capture the reader’s attention and not make the book boring in between. He beautifully describes the story of Hanuman’s life. Through the whole book, he keeps talking about what is Dharma, Parama Dharma, etc. This way he also teaches us more about Indian culture, through a story. I liked the way he favored Hanuman and told us about his habits, culture, fears and his qualities. He also sympathized Vali as he was almost a servant for his mother Riksharaja.